It is well and truly springtime now. Everything is greening and flowering. Our wildflower seeds have begun to sprout, so we're all waiting with baited breath to see what will grow. Our photonia bushes are covered in sweet white blossoms; they smell wonderful. The trumpet vine has its leaves but it will be another month before the orange flowers bloom. This week it has been downright hot, reaching the mid-eighties for the past few days. It's just slightly too warm inside the house now too; the Bear reconnected our swamp cooler over the weekend. We haven't turned it on yet, but we'll be using it every day by the end of this month. As I mentioned the other day, May is a time of winding down for us. Both small Bears will be finished with school for the summer in just three weeks. Homeschooling will continue, to keep skills sharp. There will be swimming lessons at the local neighborhood pool, a family trip to Denver to visit national parks, museums and the zoo, summer reading program activities and events at the library, and a generally more relaxed approach to daily life. But first, we need to get through the whirlwind of events over the next few weeks. There will be musical performances at schools, picnics with classmates, a guitar class performance and a dance recital (or "sharing session," when you're a four-year-old ballerina). This week, we will "recommit" to another year at the LB's school; this is an annual event which helps the administration decide the class placement for next year. It's really just a head-count, but it's also a statement of intention to continue with the special combination homeschool/traditional school program at the school. The GB is already registered for another year at her preschool; she'll go an extra morning this coming year, three instead of two, getting her ready for kindergarten the following year. This month, I hope to begin using the outdoor firepit. It's just a small portable one; I'd love to have a permanent one built someday. But I like the little one we have; it's really nice to sit outside in the evening with a little fire and a drink. The Bear and I will go out after the kids are in bed; sometimes we make s'mores or roast hot dogs. Randomly, we might see fireworks in the distance or observe shooting stars in the sky. Our backyard is one of my favorite places in the summer. The Bear's parents will arrive in New Mexico this month, as per usual. They are globe-trotting expatriate retirees with homes on three continents. They have a condominium here in Albuquerque and houses in Panama and on New Zealand's North Island. NZ is technically their permanent home. They will be here into the fall, probably early November; they never have to experience winter with this schedule. We like having them around; they're truly interesting people. At the end of the month, we will celebrate eleven years of marriage. We already have a night of babysitting scheduled with the Bear's parents so that we can go out for dinner child-free. I'm so excited for this one meal, you'd think I was going on a dream vacation. Even if the food isn't any good, the company - and the lack of responsibility - will be heavenly. I love those two little people with all my heart but they lack a certain refinement. I have several different sewing and crocheting projects planned for the summer; all of them smaller so that I don't have to hold something big over my body to work on it. 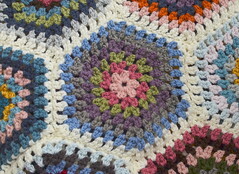 I made a big afghan last summer and I kind of learned my lesson after that. 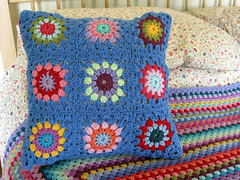 I do have a baby-sized one to make by September for a friend having a baby girl; I could manage a little one, I think. What will May be like for you? I hope it brings you pleasant weather and happy adventures. it puts mine to shame. 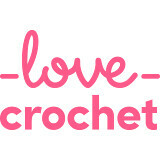 Can't wait to see your new sewing and crochet projects. Your summer holidays sound like the kind of balance I try to strike. Enjoy your child free evening too. Yes we do love them dearly, but sometimes that special meal out doesn't include fries and a shake!! Your holiday plans sound lovely! Happy May to you. Sounds like you have a fun and exciting month planned. Congratulations on 11 years of marriage <3. I love your photos and I'm quite intrigued by your swamp cooler - our days are getting very warm now. Have a happy day! Oh...we have a firepit at the cottage...and we love it!!! We also have a HUGE bonfire built, but have to wait for the right wind to burn that...don't want to smoke the neighbours out!! hahaha! Wow you do have a lot of exciting and beautiful events coming up this month. Ballet recital would be so unbearably adorable with 4 year olds! I have to ask, when is your anniversary? We will be celebrating 6 years on the 26th. Dinner alone is what I look forward to too! It sounds like May will fly by for you with all of your plans and activities. I laughed about your blanket project from last summer. I have learned the same lesson with knitting sweaters. Small things like socks and mittens are much better suited to warm weather knitting!